Fire fighters about to search the debris at the smouldering site of the Georgetown Prison. At the same time, efforts were being made to relocate many of the more than 1,000 prisoners from a highly fenced sprawling plot of land at Lusignan near the prison. Six magistrates from Georgetown, East Bank Demerara and East Coast Demerara also visited the Lusignan facility to grant the release of a number of inmates for minor non-violent offences and also granted self-bail for several on remand for non-violent minor offences. Sources told Demerara Waves Online News that about 150 of prisoners were due to be transferred to the Mazaruni Prison later Monday. Public Security Minister, Khemraj Ramjattan said Tuesday’s National Security Meeting also decided that other prisoners would be sent to Lusignan and New Amsterdam prisons. At the Georgetown Prison, mopping up work was in progress at the ‘Clement Rohee’ concrete block, the only building that remains standing in the prison yard; the colonial-era wooden structures have been destroyed. Sources indicate that steps are being taken to prepare that facility for the eventual return of a number of inmates. Rohee was Home Affairs Minister at the time that block was constructed. The ‘Clement Rohee’ concrete prison block; the only section of the Georgetown Prison that remained largely intact after Sunday’s fire. 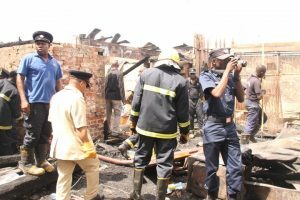 Fire fighters were seen extinguishing pockets of fire while they continued to search for the bodies of anyone who might have perished in Sunday’s blaze. No one with burns were rushed to the Georgetown Public Hospital Corporation, and no dead bodies were taken to the mortuary. 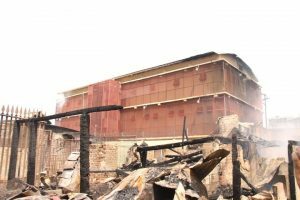 Prison officers and fire fighters were also awaiting the arrival of heavy duty equipment to break open an armoury where numerous guns and ammunition were stored. Back at Lusignan, soldiers and police, guarding the outer area of the fence at Lusignan, Monday morning responded to efforts by an inmate to scale the fence. One gunshot was heard and shortly after armed soliders, police and prison service personnel were seen running to the outer area of a very high concrete fence with barbed wire. Multiple sources also told Demerara Waves Online News that on arrival at the Lusignan holding facility, the prisoners damaged one of the vehicles that transported them and at one time even seized the key. They also shredded the tarpaulin of an army truck while they were being taken to Lusignan Sunday night. After entering the well-lit open space, several of them reportedly destroyed the flood lights. More portable flood lights have since been moved to the outer area to assist members of the security forces in monitoring the restive. 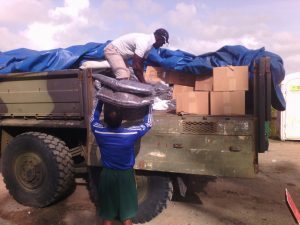 Supplies being delivered by the Civil Defence Commission to the Lusignan Prison for the more than 1,000 inmates who were evacuated and relocated temporarily. The Civil Defence Commission (CDC), which was activated Sunday night to respond to the crisis, began moving in much needed supplies. “The Civil Defence Commission has dispatched blankets, bottled water, mattresses and eating compartments to the Lusignan Prison to assist in efforts to improve the conditions of the prisoners being temporarily held there,” government said. Concerned relatives and others associated with the inmates were kept at bay police from going further south. Commissioner of Police, Seelall Persaud , following an extended National Security Meeting that was held at Camp Ayanganna following the situation at the Georgetown Prison said one of the five escapees was spotted in the city. Georgetown.” The other escapee has been identified as Stafrei Hopkinson Alexander. The 32-year old Hopkinson’s last known address is Laing Avenue, Georgetown. 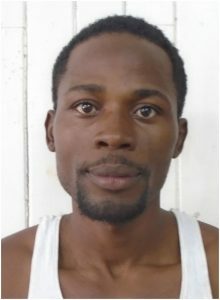 Wanted bulletins have been already issued for Royden Williams, who was sentenced to death for the Bartica massacre, and Uree Varswyck who has been committed to stand trial for a robbery-murder. They are wanted by the police for questioning in relation to murder and escaping from lawful custody at the Georgetown Prison. “Prisoners are being attended too, the conditions there are little harsh but there will be significant improvements to that within the next 24 hours,” Persaud said. Police said anyone with information that may lead to the arrest of any of the wanted persons is asked to contact the police on telephone numbers 225-6411, 225-8196, 225-2227, 227-1149, 226-7065, 911 or the nearest police station. The Guyana Police Force said all information will be treated with the strictest confidence. Two prisoners were shot while attempting to escape from police and soldiers Sunday night. One of the eight prison officers, who were chopped and shot by inmates, succumbed Sunday night to gunshot wounds. Authorities said the five inmates deliberately set the Georgetown Prison alight to distract security personnel while they bolted from the prison. Once outside, they hijacked a car and fled the scene. More than one year ago in March, 2016, the then worst prison riot in Guyana’s history resulted in the burning death of 16 inmates.